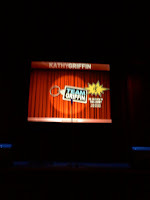 Karen and I went to see the comedian Kathy Griffin tonight at the Hanover. 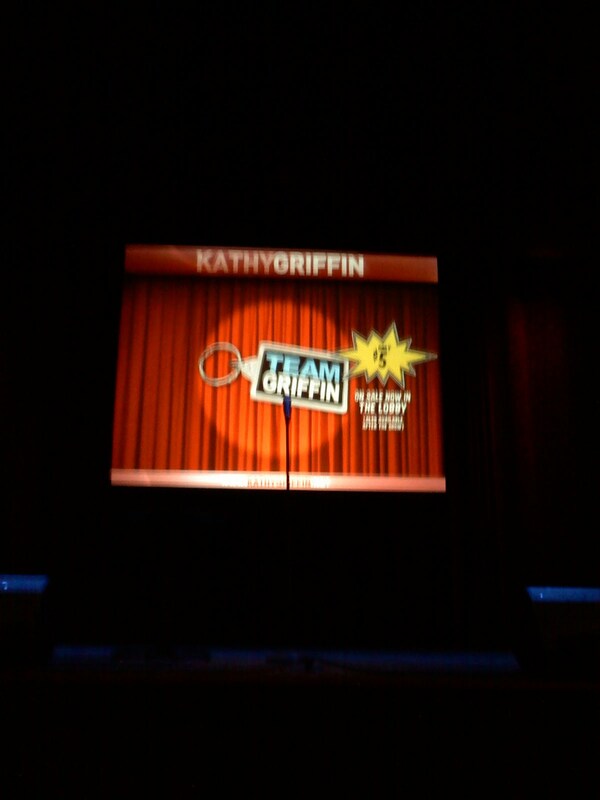 Karen turned 40 this past September and since we both love Kathy Griffin, I thought treating her to (nearly) front row center seats would be a great gift. Kathy walked out to the roar of the crowd and just did a fantastic job owning the entire place. She dished on celebrities, talked about how she dedicated a chapter of her book about a bad stand-up performance in Worcester and closed the show by reading a purported drunk 2am email from her mother Maggie sharing her Last Wishes. I hate crowds so naturally I stayed behind while everybody filed out. I passed the time by taking some photos of the ornate chandeliers and got a pretty good picture of Karen talking on her cell phone, but here's the best part: as we were beginning to leave this middle-aged woman walked up to the stage and asked the stage hand if she could have the red plastic cup that Kathy used to drink her water from during the performance. The look on the guys face was precious and I wish I could have captured the moment. He must have been thinking, "Really? You want the plastic cup? OK... here take it. Less trash for me to clean up." Speaking of trash...I was feeling kind of bad seeing all the senior citizen ushers walking through the aisles after the show collecting the empty glass beer bottles and cups left by the audience. It made me sad. Way to keep it classy Worcester.